Uneasy Lies The Head concludes the tale of Henry IV Part Two. As the episode opens, a sickly Henry (Tom Fleming) is still awake in the early hours of the morning and muses on why everybody should be asleep but he. As with the previous episodes, Fleming is very good and whilst he doesn’t have a great deal to do (this scene and his deathbed scene are his two main moments) he’s still compelling to watch. But as with The New Conspiracy the focus of the piece (at the start anyway) is concerned with Falstaff’s misadventures. But he’s met his comic match when he comes up against Justice Shallow (William Squire). Squire delivers a fine performance as the fussy, reflective Shallow and he’s one of the highlights of Uneasy Lies The Head. The heart of the piece, though, is the death of the King and Hal’s elevation to the throne. Believing the King to be dead, Hal takes away the crown, but Henry still has breath in his body and is dismayed to find his crown missing. Hal explains his actions (some quality acting here from both Robert Hardy and Tom Fleming) and they are reconciled just before Henry’s death. Once Hal has become King Henry V there is one important matter to be dealt with – that of Falstaff. Although I can’t confess to have been greatly enamoured with Frank Pettingell’s performance during the last few episodes, he does manage to capture very well Falstaff’s shock and hurt when Henry publicly disowns him. Hardy’s delivery here is spot on – and his journey from wastrel Prince to King Henry V is completed. But, being awaked, I do despise my dream. For thee thrice wider than for other men. As the credits roll, there’s one more surprise. We see the actors removing their stage clothes and talking amongst themselves whilst the camera gradually focuses on William Squire. Squire removes the white wig and false nose of Shallow and after the credits have finished he steps forward to deliver the epilogue of the play which promises the return of Falstaff (something which didn’t happen as Shakespeare obviously changed his mind – Falstaff dies off-stage in Henry V). The breaking of the fourth wall is somehow in keeping with the theatrical tradition of the piece and it’s an interesting conclusion to the episode. The Road To Shrewsbury opens with Hotspur (Sean Connery) enduring the boastful claims of his ally Owen Glendower (William Squire). Although Glendower isn’t a large part, it’s a scene-stealing gift for any decent actor and Squire certainly takes advantage. Although Squire was born in Neath, Glamorgan, few of his more familiar roles (he was probably best known for appearing opposite Edward Woodward in the Thames series of Callan) called on him to use a Welsh accent, so this is a good opportunity for him to act broadly Welsh. Glendower is certainly a character that has, shall we say, a good opinion of himself. Hotspur seems unimpressed with such hyperbole and Connery plays this opening section well – capturing the mocking and insolent nature of Hotspur, which still manages to earn the respect of Glendower. On the other side, Hal (Robert Hardy) is re-united with his father, the King (Tom Fleming). Although Hal initially seems to be the same casual character we saw in Rebellion from the North, very quickly it becomes apparent that he’s now prepared to put aside his dissolute past and grasp his destiny. 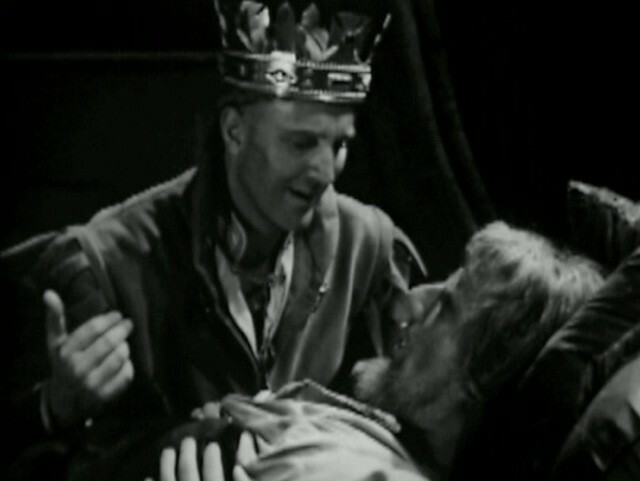 Although Connery is more central to the episode than Hardy (at least until the closing fifteen minutes or so), Hardy is more than able to make a favourable impression during these scenes with the King, and Tom Fleming as Henry IV continues to impress. Battle scenes throughout An Age of Kings are always somewhat problematic. The nature of live recording, small casts and the limited studio space are all factors which need to be appreciated. 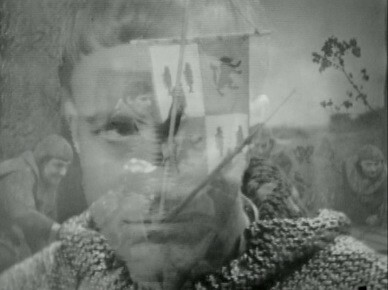 There are a few interesting moments though – initially shots of the battlefield are overlaid on the faces of Hotspur and Hal, for example. Elsewhere, the viewer is required to use their imagination that while they can hear an army offscreen, they can only see a handful of soldiers (this, of course, is a similar experience to watching the play on the stage). Eventually, Hotspur and Hal meet and duel to the death. Their sword-fight (not overly convincing it must be said) is inter-cut with shots of dead bodies on the battlefield and it’s noticeable that Hal’s killing thrust isn’t seen. Was it deemed too violent for the times or did the camera just miss it? Director Michael Hayes elects to end the episode on the battlefield dead, this time with snow overlaid, which is quite an effective ending. Henry IV Part One has never been a favourite play of mine and this adaptation, whilst solid enough, hasn’t really changed my opinion on it, but it’s well worth watching for Connery and Hardy. The Deposing of a King concludes the story of Richard II, begun in The Hollow Crown. 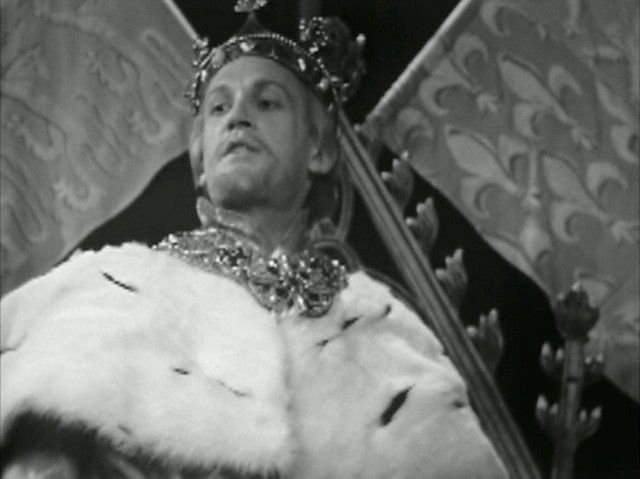 It quickly becomes apparent to Richard (David William) that Bolingbroke (Tom Fleming) holds such a strong position of power that he has no other course of action than to stand aside and offer the crown to him. This is very much David William’s episode – he has the majority of the speeches and he’s very impressive as he divests himself of the duties of Kingship. His best moments though, come in Act V Scene 5. Richard is incarcerated in Pomfret Castle and considers his death, which he knows will shortly come. Here, the limitations of live performance are used to the series’ benefit, as the whole scene (lasting over nine minutes) which encompasses his speech, a discussion with a friendly groom (Julian Glover) and his murder are played out with just a single camera. Elsewhere, Frank Windsor, who impressed in The Hollow Crown, has another good scene here, as he defends Richard against Bolingbroke and the rest of the nobles. Another small, but telling performance, comes from Gordon Gostelow as the gardener who breaks the news to the Queen that Bolingbroke has seized power. Next Up – Episode Three – Rebellion From The North. Episode One of An Age Of Kings adapts the first half of Richard II. David William is Richard and he gives a decent performance in this first episode, as we see him move from regal majesty to arrogant petulance. His performance isn’t quite perfect though – and he’s certainly better in the second episode – although his final scene here, as he laments his misfortunes, is a definite highlight. The play opens with Bolingbroke (Tom Fleming) and Mowbray (Noel Johnson) who request an audience with the King to seek his advice in settling their dispute (Bolingbroke alleges that Mowbray has squandered monies which should have been spent on the Kings’ soldiers). The two men find it impossible to resolve their differences, so a trial of arms seems to be the only course of action. But just before the duel commences, Richard announces a different plan – banishment from the realms of England. Mowbray is to be banished for life, whilst Bolingbroke is to leave the shores of England for ten years (later reduced by the King to six). Both Fleming and Johnson are impressive in these early scenes, although the limitations of live television and the somewhat cumbersome nature of the cameras does become apparent since it’s several minutes before a camera is able to manoeuvre sufficiently to allow us a decent shot of Johnson (prior to this he’s only seen from the side). Bolingbroke’s father, the Duke of Gaunt (Edgar Wreford) takes this news particularly badly and quickly sickens. And it’s Richard’s decision, upon Gaunt’s death, to sieze his lands and money which sets in motion the chain of events which seal Richard’s fate. What isn’t so well known is that the speech isn’t actually painting an idealised and romantic view of England, since Gaunt carries on to express his dismay at how the country is suffering under the reign of Richard. 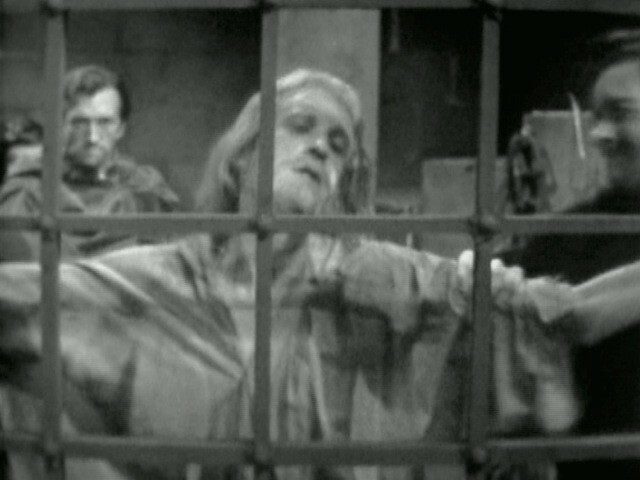 Also impressive in this episode is Geoffrey Bayldon as the Duke of York (who skillfully manages to smooth over a line fluff – as this is live television there will be more to come over the following weeks). There’s also a certain pleasure in watching the likes of George A. Cooper (an actor who went on to have a long and varied career on television and is probably best known for playing the grumpy caretaker in Grange Hill) rubbing sholdiers with Sean Connery. Connery (like Julian Glover) only has a few lines here, but we’ll hear a lot more from both of them in forthcoming installments. Also impressive in a small role is Frank Windsor as the Bishop of Carlisle. Act 1 Scene 2 (the Duke of Gaunt and the Duchess of Gloucester at the Duke of Lancaster’s palace) is excised from the adaptation. This helps to speed up the play in the early stages as well as keeping the focus on Bolingbroke and Mowbray. Next up – Episode Two – The Deposing of a King.